SA13’s definition of this creation as a dish is really quite limiting, given that just looking at it for a few seconds and taking in the bold design and eye-catching colours will prove that the Lion plate is a real work of art by Italian craftsmen. They managed to get such an astute masterpiece to fit on a plate of medium, 24 cm diameter stature. 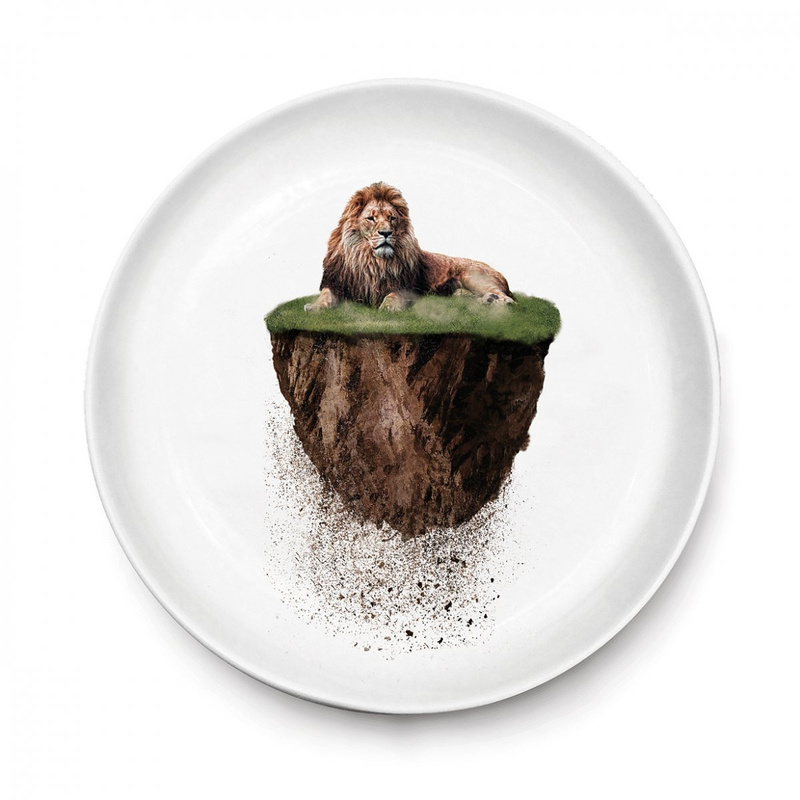 The Lion plate is one of the items included in the "You are not here" line, a project by brand SA13 that strives to develop a very unique decorative theme. The idea behind this collection is to welcome us to save the things we love, to pick them up and take them with us, even if this requires a tremendous effort. The lion depicted on this dish, proudly showing off his thick fur, is located on a piece of land that was literally uprooted from the ground. The animal, meanwhile, appears calm and settled at the scene. Originality steals the show in this design, but the artistic sense is the real emphasis. This portrayal is downright exquisite, meticulously detail-oriented and very charming via its natural colours: the falling stones also enhance the figure, as if the piece of land has just been uprooted. SA13 offers several themed dishes in its collection "You are not here", and juxtaposing them can be an excellent idea to accentuate their beautiful aesthetic, whether you want to use them on the table, or simply keep them out for display. The Lion plate is a genuine designer piece, and you can display it in a window, in a cabinet, on a shelf, anywhere. Its rather unusual decoration will certainly catch your eye at first glance. This SA13 plate can definitely be a good starting point for those who are looking for an appealing gift idea. Usage: may not be used in the microwave. Wash at maximum 60 °C in dishwasher.